It’s new, it’s curated, and it’s here. Topping this week’s BEST BETS column, again, are the world premieres of “The Flower Room” (Actor’s Express) and “Ripe Frenzy” (closing Sunday at Synchronicity), plus 7 Stages’ timely “Revolt” and the opening of “Candide” in concert by the Alliance Theatre and Atlanta Symphony Orchestra. And, “Hamilton,” yes, “Hamilton” is just around the bend. Note: Saturday’s ASO concert with cellist Yo-Yo Ma is sold out. Pictured: A few of designer Lex Liang’s costume renderings for “Candide.” Photo by A’riel Tinter. ** The Flower Room. THROUGH MAY 13. Actor’s Express. World premiere. 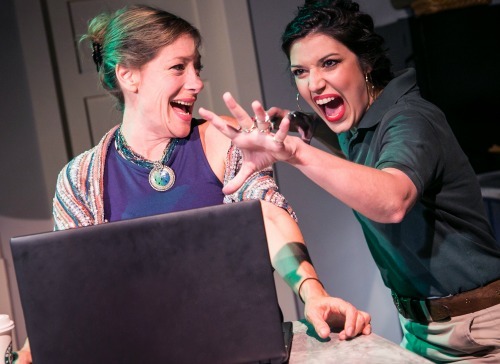 Atlanta playwright Daryl Lisa Fazio’s comedy follows an uptight academic named Ingrid (Stacy Melich), who researches sexual behavior in primitive cultures while remaining closed off from her own sexual side. When she loses her university job, she turns to writing erotica to pay the bills — unleashing her own journey of, well, discovery. Express regular Melissa Foulger directs a cast that includes Matthew Busch (The Thrush and the Woodpecker), Eliana Marianes and Joshua Quinn. $31-$44. King Plow Arts Center, 887 West Marietta St. NW. Details, tickets HERE or at 404.607.7469. Discount tickets at PoshDealz.com. Revolt. She Said. Revolt Again. THROUGH MAY 13. 7 Stages. British playwright Alice Birch’s 2014 script has a way of making you question everything you say when it comes to discussing women and their relationships with men, one another and the world. 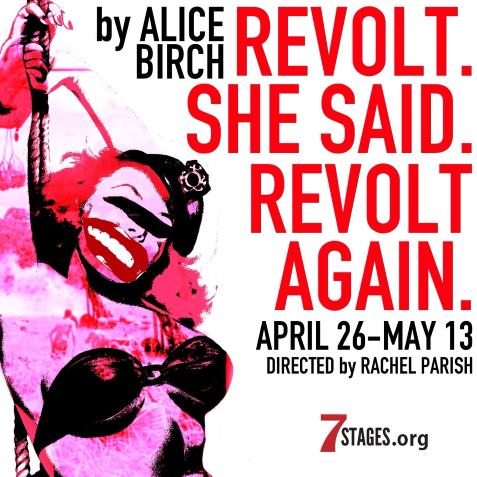 7 Stages says it decided to produce Revolt “to address the urgent mood in our community and nation surrounding issues of women’s rights and systemic prejudice.” Atlanta-based theater artist Rachel Parish directs. Her cast: Dorothy Victoria Bell-Polk, Christopher Hampton, Renita James, Brooke Owens, two-time Suzi Bass Award winner Mary Lynn Owen and Patrick Wade. On the mainstage. $22.50-$28. Through May 13. 8 p.m. Thursday-Saturday; 5 p.m. Sunday. 1105 Euclid Ave. NE. Details, tickets HERE or at 404.523.7647. ** Ripe Frenzy. CLOSES SUNDAY. Synchronicity Theatre. This world premiere by Jennifer Barclay won the National New Play Network’s 2016 Smith Prize for Political Theater. It tells the before and after of a mass shooting in a small American town from multiple points of view and through the lens of Thornton Wilder’s classic play Our Town. “It’s about what got us here,” says director Rachel May. “And what we do afterward.” Community conversations follow each performance. The cast: Taylor M. Dooley (Aurora Theatre’s Burnpile); Danyé Brown; Megan Cramer (Georgia Shakespeare, back in the day); Parker Fox Ciliax; and Lizzy Liu. $27-$31 (swanky seat upgrades available). 8 p.m. Wednesday-Saturday; 5 p.m. Sunday. Synchronicity Theatre in Midtown’s One Peachtree Pointe building, 1545 Peachtree St. NE. Details, tickets HERE or at 404.484.8636. Candide. OPENS MAY 9. The Alliance Theatre and Atlanta Symphony Orchestra co-produce a staged concert of Leonard Bernstein’s notoriously difficult 1956 musical opera, based on Voltaire’s satirical 1759 novel about a naïve young man who searches the world for his lost beloved while fiercely believing — as he’s been taught — that his is the best of all possible worlds. 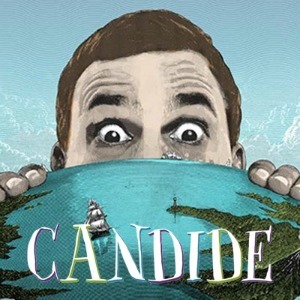 Candide features a cast of 17 (including Broadway’s Christopher Sieber and Broadway/Atlanta’s Terry Burrell) and the Atlanta Symphony Orchestra and Chorus, with Robert Spano conducting. 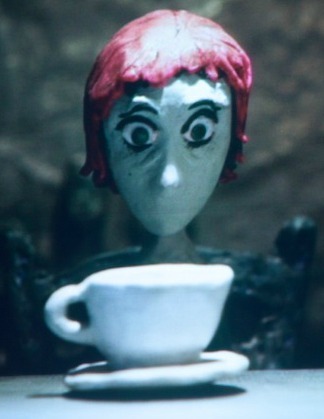 Puppetry and projections are employed as well. Recommended for age 12+ (violence and mild sexual situations). $10-$75. Through May 20. 8 p.m. Wednesday-Saturday; 3 p.m. Sunday. Symphony Hall, Woodruff Arts Center, 1280 Peachtree St. NE. 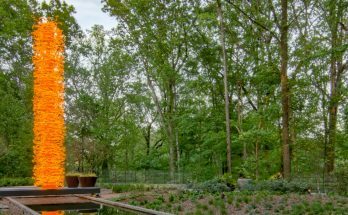 Details, tickets HERE or at 404.733.5000. Discount tickets at PoshDealz.com. 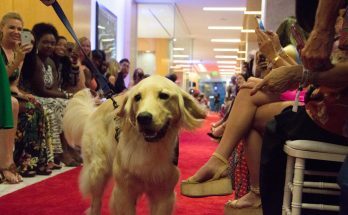 A Funny Thing Happened on the Way to the Gynecologic Oncology Unit at Memorial Sloan Kettering Cancer Center of New York City. OPENS FRIDAY. 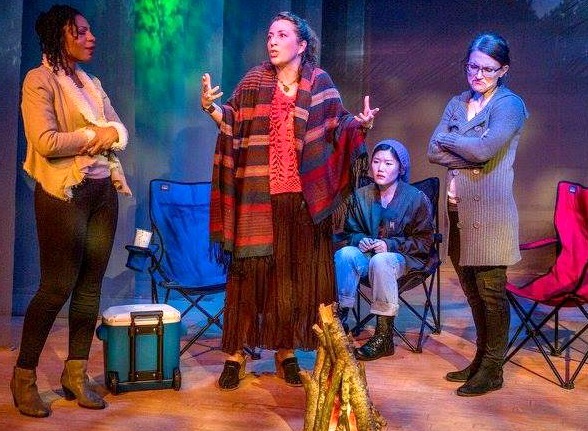 Southeastern premiere from the new Atlanta Theatre Club, which describes itself as an itinerant, women-centric company that produces contemporary plays. The New York Times called Halley Feiffer’s 2016 comedy “as deeply felt as its name is long” and said it “explores that tender spot where uncontrollable laughter and uncontainable tears meet.” Jennifer Silver directs. Her cast: Douglas Dickerman, Ellen McQueen, Rebeca Robles and Virginia Kirby. $27. Through May 20. 8 p.m. Wednesday-Saturday; 6 p.m. Sunday. Performed at Pinch ‘n’ Ouch Theatre, 1085 Ponce de Leon Ave. NE. Details, tickets HERE. Sordid Lives. OPENS THURSDAY. Out Front Theatre. Chaos erupts in Winters, Texas, when a good Christian woman named Peggy hits her head on the sink and bleeds to death in a motel room after tripping over her lover’s wooden legs. The 1996 comedy is by the somewhat-infamous Del Shores, a Texas-born, Los Angeles-based director, writer, producer, stand-up comic, gay and human rights activist and, in his own words, all-around sh*t-stirrer. The Los Angeles Times calls him “a master of Texas comedy;” Daily Variety the “grand master of Southern lowlife sensibilities.” In a twist, Out Front’s staging is being done with a largely African-American cast. The company’s Jacob Demlow directs. The actors: Lisa Boyd, Fracena Byrd, Jordan Ford, Darrell Grant, T.K. Haile, Abby Holland, Britny Horton, Jason Jamal Ligon, Bert Lyons, Jessica Maguire, Wendy Melkonian and Brittani Minnieweather. Out Front is holding two special events in conjunction with the run. 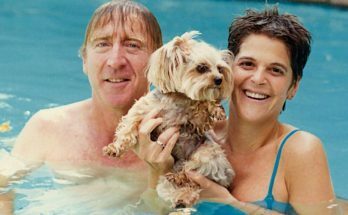 At 3 p.m. May 19, it partners with Out on Film to screen Shores’ A Very Sordid Wedding, a sequel to the stage comedy, which Shores will attend ($10 + $35). At 7 p.m. May 20, it presents Shores in his one-man Pirandello riff-off, Six Characters in Search of a Play ($35 + $70). 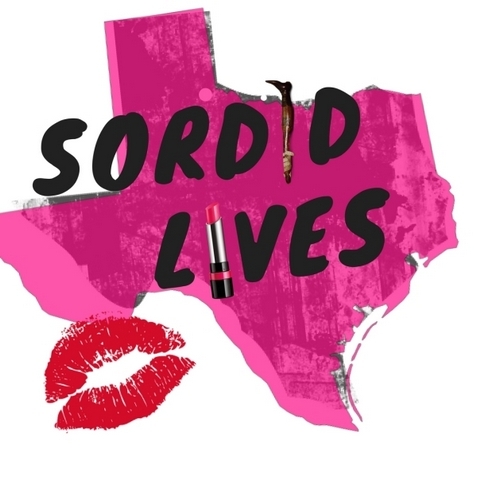 Sordid Lives tix are $15-$25. It runs through May 20. 8 p.m. Thursday-Saturday; 3 p.m. Sunday. 999 Brady Ave. NW in West Midtown. Details, tickets HERE or at 404.448.2755. 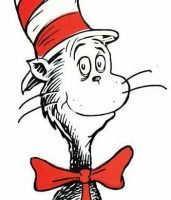 Dr. Seuss’ The Cat in the Hat. THROUGH MAY 13. Center for Puppetry Arts. It’s fun to have fun, but you have to know how, says the sassy cat in the red-and-white hat. He’s feline full of mischief (and magic) in this stage telling, done with rod puppets and based on the 1957 children’s book by Theodor Geisel, aka Dr. Seuss. This version was first produced by the National Theatre of Great Britain. The center’s Jon Ludwig directs here. For age 4 and up. $11.25-$19.50. Showtimes: 10 + 11 a.m. Tuesday-Friday; 11 a.m. + 1 p.m. Saturday; and 1 + 3 p.m. Sunday. 1404 Spring St. NW. Details, tickets HERE or at 404.873.3391. Lazybed. THROUGH MAY 13.. Arís!, Atlanta’s stage for Celtic culture, takes on Scottish playwright Iain Crichton Smith’s dark philosophical comedy about a man in the midst of a metaphysical crisis, essentially a meditation on life, death, love and the meaning of all we hold dear. Murdo, the man in question, is a Scottish crofter (farmer) who has taken to his bed. While he malingers, he’s visited by his brother, his gossipy neighbor, his girlfriend, an insurance salesman, a minister, a medical specialist, Immanuel Kant and Death — who keeps stopping by to chat. Kyle Crew directs. $23-$28. 8 p.m. Thursday-Saturday; 2:30 p.m. Sunday. 7 Stages Back Stage Theatre, 1105 Euclid Ave. NE. Details, tickets HERE. The Life and Death of Richard the Second. THROUGH MAY 13. Shakespeare Tavern Playhouse. 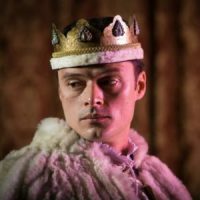 In this history play, King Richard (Lee Osorio) lies and steals his way to riches in order to finance his invasion of Irish lands but is taken down by Henry Bolingbroke (Maurice Ralston) and the Earl of Northumberland (Al Stilo) and imprisoned, leading to the crowning of King Henry IV. Also in the cast: J. Tony Brown, Chris Hecke, Heidi Cline McKerley and Tamil Periasamy. $21-$42. 7:30 p.m. Thursday-Saturday; 6:30 p.m. Sunday. Pub menu and full bar available. 499 Peachtree St. NE (parking suggested in the Emory University Hospital Midtown deck across the street). Details, tickets HERE or at 404.874.5299, Ext. 0. 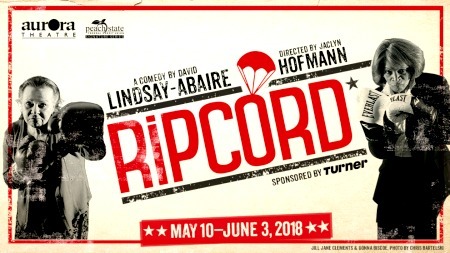 Ripcord. OPENS MAY 10. Aurora Theatre calls this 2016 comic-drama from Pulitzer Prize winner David Lindsay-Abaire (Good People, Rabbit Hole, Kimberly Akimbo) “The Odd Couple” meets “The Golden Girls.” Crabby Abby (Donna Biscoe) and her new roommate (the too-rarely seen Jill Jane Clements) vie for prime real estate at the Bristol Place Senior Living Facility, in a contest that becomes a pitched battle with no end in sight. Jaclyn Hofmann directs. Also in the cast: Megan Rose, Seun Soyemi and Jacob York. $20-$55. Through June 3. 8 p.m. Tuesday-Friday; 2:30 + 8 p.m Saturday; 2:30 p.m. Sunday. Free, covered, attached parking in city deck at 153 E. Crogan St. Details, tickets HERE or at 678.226.6222. Xperimental Puppetry Theater. MAY 10-13. Center for Puppetry Arts. See what happens when dozens of multidisciplinary artists come together for this annual event that offers professional and emerging artists a place to explore and experiment, and create original and bold puppet theater. Live shows, films and installations can all be a part of decidedly adult fun. Titles unavailable at deadline, but the event usually is a hot ticket. $15. 8 p.m. Thursday-Saturday; 5 p.m. Sunday. 1404 Spring St. NW in Midtown. Details, tickets HERE or at 404.873.3391. Hamilton. MAY 22-JUNE 10. Broadway in Atlanta at the Fox Theatre. Lin-Manuel Miranda’s game-changing, genre-mixing, award-winning masterpiece finally comes to Atlanta for a three-week run, telling the story of Founding Father Alexander Hamilton — and the young nation he adopts — from his impoverished boyhood to his infamous death. American history never sounded as good as it does with Miranda’s score, which blends hip-hop, jazz, blues, rap, R&B and Broadway sounds. It’s no hyperbole when producers claim that Hamilton is the story of America then as told by America now, with a multicultural cast no less. $80-$625 (if you can find a ticket). May 22-29 shows are essentially sold out. Limited seats remain for performances on May 29-31 and June 2-10. 7:30 p.m. Tuesday-Thursday; 8 p.m. Friday; 2 + 8 p.m. Saturday; 1 + 6:30 p.m. Sunday. 660 Peachtree St. NE in Midtown. Details, tickets HERE or at 855.285.8499. Good luck! Get the official program at PoshDealz.com. Previous Article THEATER. OPERA. CONCERT.